Whenever you put a substance in or on your body, it’s a good idea to understand the potential side effects. Despite all of the negative press associated with e-cigarettes, the short-term risks are well understood, and for the most part the side effects of vaping are mild and temporary. That’s not to say that vaping is completely harmless, and it’s far too early to make claims about the true long-term impact of electronic cigarettes. Before we move any further, let me preface this article by saying that even though the short-term side effects of vaping are well documented, research is still being conducted and it will likely take years for the long-term effects of e-cigarettes to be fully understood. With that being said, the research thus far is clear – vaping is safer and significantly less harmful than smoking traditional cigarettes. Much of what we know about the side effects of vaping comes from e-cigarette users themselves. A number of peer-reviewed research studies from Lynne Dawkins, Jean-Francios Etter and Konstantinos Farsalinos have outlined the reported side effects. In addition, numerous studies evaluating the effectiveness of e-cigarettes on smoking cessation have also covered the topic. Coughing – New users who are not accustomed to inhaling vaporized nicotine are likely to experience coughing while learning to use an electronic cigarette or vaporizer. This is definitely the most common side effect of vaping. Research suggests that 20 to 30% of new users experience coughing while using an e-cigarette. The coughing is often caused by throat irritation due to nicotine and / or propylene glycol (PG) used within the e-liquid. Luckily, these symptoms usually dissipate after the user becomes accustomed to inhaling vapor. Headaches – Often caused by dehydration, headaches can also be a sign of an overexposure to nicotine. Many new vapers experience headaches, but just like coughing, the symptoms usually dissipate with time. Another possible cause is an allergic reaction to propylene glycol (PG) – see below. Dizziness / Nausea – Although most users don’t experience this unpleasant side effect, vaping has been known to cause dizziness or nausea in some users. Once again, this could be caused by dehydration or a response to propylene glycol (PG), but an overexposure to nicotine is the most likely culprit. COMMON SOLUTIONS: For all of the issues discussed so far, there are several simple solutions to consider. First, give it some time. Some of these side effects are likely to dissipate as you adapt to vaping. Second, drink more water! Dehydration is responsible for many vaping side effects. Third, consider lowering the nicotine level of your e-liquid – or vape less frequently to prevent overexposure. If you’re still having issues, see below. While an allergic reaction to PG or VG is certainly possible, chances are you have a mild sensitivity to one or both of these e-liquid ingredients. The fact is, PG and VG are found in everyday foods, medicines, soaps and cosmetics; and more than likely they would have already been diagnosed as allergens long before your choice to start vaping. Sensitivity to PG results in similar symptoms as dehydration (discussed above), while sensitivity to VG has been known to cause restricted breathing, chest congestion and an increase in phlegm production. If you experience symptoms that point to a sensitivity, try choosing an e-liquid with lower amounts of PG or VG. If the problem persists, play with the mix until you a find level that works well for you – with little or no side effects. Serious reactions should be addressed immediately by a medical professional. The truth is, consuming too much nicotine can lead to most of the vaping side effects we’ve discussed in this article. When you’re just starting out with an electronic cigarette it can be easy to misjudge just how much nicotine you’re using; that’s why it’s important to start off slow and determine the appropriate nicotine level for your vaping needs. We often suggest that smokers start out with 6mg, and then work up or down from there. Most people know that nicotine comes with a variety of health-related risks and side effects, but it’s certainly not as dangerous as many want you to believe. Nicotine is a mild stimulant similar to caffeine; and even though it’s certainly addicting, research suggests that e-cigarettes are less addictive than tobacco cigarettes. This is probably due to the fact that tobacco cigarettes are loaded with other chemicals, which contribute to their addictive qualities. 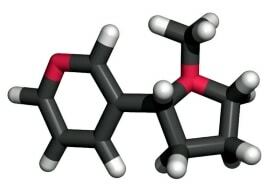 And despite the popular misconception – NICOTINE DOES NOT CAUSE CANCER. Numerous studies have proven this fact, and once again it’s the other toxic chemicals found in tobacco smoke that do the most harm. Nicotine has actually been shown to have some positive benefits, including: mood enhancement, appetite suppression, improved cognitive function and more. If you notice any of these symptoms, it’s probably a good idea to put your e-cigarette down and take a break. Although a nicotine overdose is extremely unlikely, dealing with anxiety, headaches and nausea definitely isn’t fun. In general, the side effects of vaping are often nuisances, rather than life altering or dangerous. If you’re a smoker looking to quit, the annoying effects are often short-lived and far outweigh the risk of continuing to use tobacco. Throw in all of the positive side effects and you should have plenty of reasons to kick the habit!